MRS. KILBURN SCOTT, VALE HOUSE, BURNT ASH LANE, BROMLEY, KENT. IT is impossible to think of the word Samoyede without at once bracketing it with the name of Kilburn Scott, and no breed owes so much to anyone as does this Arctic do.g to the owners of the Vale House Kennels. Indeed, Mr. and Mrs. Kilburn Scott’s connection with the breed is quite without precedent in the annals of the fancy. 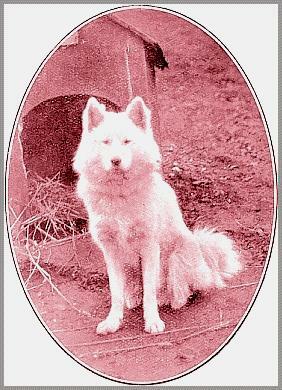 The Samoyede dog was introduced into Britain from North-East Russia as the result of a holiday which Mr. Kilburn Scott spent there in 1889, and the purchase of a puppy from the Samoyede people. Over the Tundras, which stretch eastwards from the White Sea to the Ural Mountains and into Western Siberia, the Samoyedes and their dogs have roamed at will for countless ages, so that this breed of dog is a very ancient one. In North Russia the dogs are frequently called Laika, which merely means barking dog, or by the Samoyede’s Voinaika; but Mr. Kilburn Scott decided to name the dogs after their native country, and so the breed is known as Samoyedes. Mr. Borchgrevink, the Norwegian explorer who led Sir George Newnes’ expedition on the Antarctic Continent, also discarded Esquimaux for Samoyede dogs, and the sledge of this expedition, and the first to cross the Antarctic Continent, is now in Mrs. Kilburn Scott’s possession, and part of it is seen in one of the accompanying photographs. Sir Ernest Shackleton also used Samoyedes, and when Captain Scott left recently for his Polar expedition he took with him a team of the breed from the Vale House Kennels. 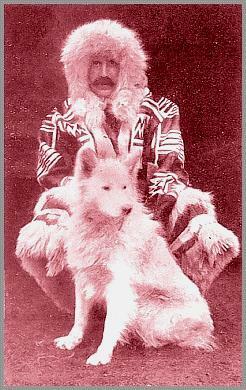 MR KILBURN SCOTT IN SAMOYEDE DRESS, WITH POLAR LIGHT. When in Sydney, Mr. Kilburn Scott found in the Zoo there,and brought home with him, a dog of the first Antarctic Expedition, and he became famous as Antarctic Buck. 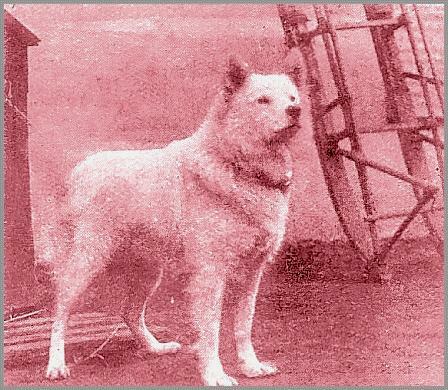 Unfortunately this magnificent dog did not long survive quarantine, but his illustrious descendant, CH FANG, is probably the finest specimen yet benched, and has won five championships, two shields of the Samoyede Club, the Club rose bowl, and Queen Alexandra’s cup. PEARLINE is another famous member of Mrs. Kilburn Scott’s stud, and the winner of four championships and numerous specials. She is a Jackson-Harmsworth Expedition dog, and has lived for ten years in the nursery with Mrs. Kilburn Scott's children. In many ways the Samoyede is looming large in the public eye. For example, in 1908 a team of Mrs. Kilburn Scott’s took part as sledge dogs in the Arctic spectacle" at the Hippodrome, London, and this year a number of her dogs were lent to the Lapland village at the Glasgow Exhibition. Recently Mr. Charles Urban had 600ft. of film taken of the dogs at Vale House accompanied and driven by the little Misses Kilburn Scott in sledges and go-carts, and they are now to be seen in colours at the Scala Theatre, where they form one of the principal items on the kinemacolour programme. Abroad, too, the appreciation of the Samoyede is extending. Won first at the S. K. C. Show, Edinburgh, and Coronation Cup Certificate. As long ago as 1903 Princess Montglyon purchased some of Mrs. Kilburn Scott’s dogs and took them to the United States, and since then many more have been sent across the Atlantic from the Bromley Kennels. On the Continent, and particularly amongst the prominent society people of Paris, the Samoyede is becoming all the rage. Lately Mrs. Kilburn Scott has sent picked specimens to Bilbao, to Vienna, and to Patagonia, and a week or so ago two of her dogs were sent to Riga, on the Baltic. Representatives of the Vale House Kennels have even reached the country of their origin, and this is not to be wondered at, as for twenty years Mrs. Kilburn Scott has been carefully selecting her dogs and mating entirely unrelated specimens from three of the Polar expeditions, as well as those she has imported. Again, the country where the true Samoyedes come from, and where the pure-white dogs are found (pure white being the most typical) is very inaccessible, being well within the Arctic Circle, and it is therefore easier for a buyer in the Baltic provinces to get the dogs from England, and with more certainty that they will be absolutely pure and correct in type, as all Mrs. Kilburn Scott’s dogs are.